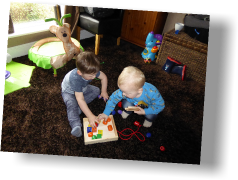 We have a wide range of toys the children can access themselves. Drawers and boxes are labelled to encourage independent learning and self-help skills. 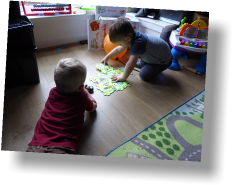 We have toys such as books, jigsaws, cards, transport vehicles, soft toys, imaginative toys dress up and food. 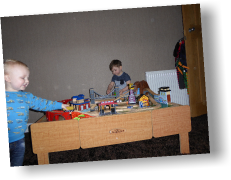 Instruments, tracks and a fantastic train table along with a trampoline and much more. I will plan and provide experiences for the children around seasons and festivals. I will follow their interests to plan and provide activities to enhance their development. Each child in my care with have a learning journal with their development logged. These activities will encourage the children to follow their next steps in their learning.